WHO SAYS BIGGER ISN'T BETTER? 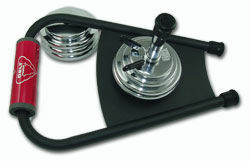 Delt Force is a patented, free-weight device that isolates and builds larger and more defined deltoid/shoulder muscles. * Effectively rehabs and strengthens rotator cuffs and shoulders. Performing traditional dumbbell raises results in strain on wrist and elbow joints while blood flow and energy is lost to lower arm and wrist muscles. As a result, deltolds can be difficult to build because they're hard to isolate for muscle fatigue and a good "burn." $3,000 "lateral raise" machines only have one fixed side motion and work mostly front delts, not allowing side delt isolation. 2 years in development, US Patent with a registered trademark. Delt Force places the weight above your elbow joint, and below your delts, eliminating the muscle drain and joint fatigue of holding dumbbells. Delt Force gives your delts the full range and freedom of movement to isolate and stimulate the maximum number of deltoid muscle fibers. Works the medial (side-lateral) delt head, increasing shoulder width, as well as the anterior (front) and posterior (rear) delt heads. 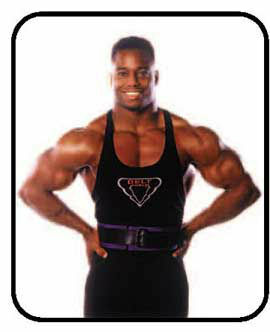 Includes 4 different shoulder-blasting exercises and professional body-builders' photo exercise chart. Proven highly effective by over 500 bodybuilders and athletes. Utilized in most NFL, NBA, and MLB training rooms. *Results may vary. 30 day money back guarantee. NOT AVAILABLE IN STORES. Never Drop the DELT FORCE®, lower it to the ground gently. It is not designed to be dropped and it will get damaged and parts/weights will eject if dropped. 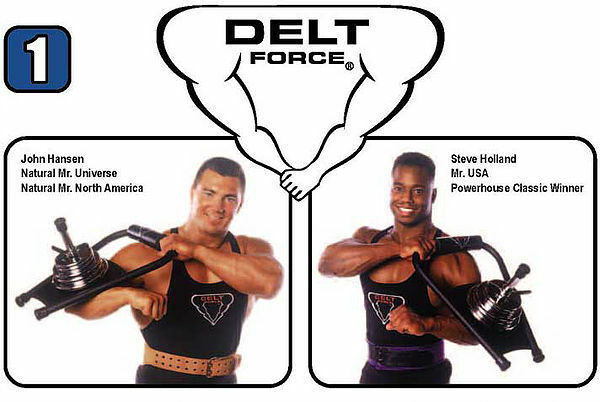 Read all instructions in this manual before using the DELT FORCE®. Work with the assistance of a partner if available. 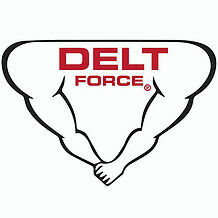 DELT FORCE® is not intended for children. 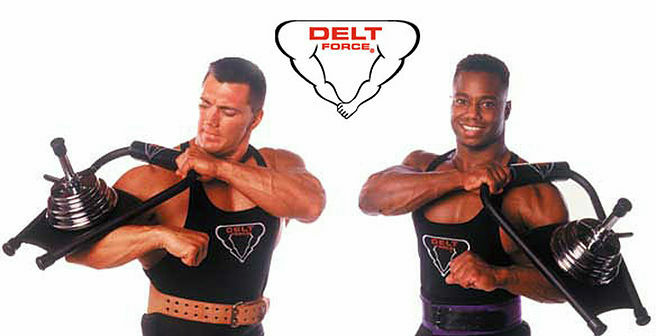 DELT FORCE® is designed for shoulder exercises only. Do not use for any other exercises. Stop using the device if you feel any discomfort or pain. See your physician before continuing use. If you have had any type of pain or injury in your shoulders or back, before using the DELT FORCE®, bring this device and these directions to a qualified sports physician so that he/she may evaluate it and decide whether it's safe for you to use. 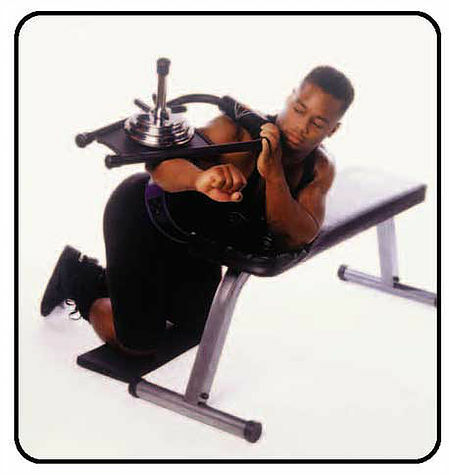 DELT FORCE® weighs 7 lbs., so you may begin the exercises below without adding weight plates, or depending on your level of strength, adding weight to device. Only add more plates according to your level of strength. 4a - Stand upright with a dumbbell in right hand out to your side. Place left hand on your delt so that you can feel your deltoid with your fingers. You will feel that your front and side delt heads are hard. This means that they are activated. Since your front delt is stronger than your side delt, the front delt does most of the lifting work when doing upright side lateral raises. 4b - Bend over at 45 degrees with your arm still out at your side. You will feel your front delt get soft, while the side delt remains hard. 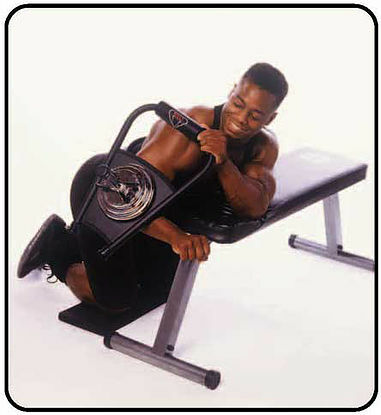 In this 45 degree body position, your side delt is isolated and does most of the lifting. See # 10 for exercise. 4c - Bend over at 90 degrees. Now, your rear delt is hard. The front and most of the side delt are soft. The rear delt does most of the work. (very important) 5 minutes of jumping jacks are good. Then, with a 5 lb. dumbbell in each hand do 2 sets (set=10) for the following slowly: (5a) Bent-over side lateral raises, (5b) Front raises, (5c) Upward presses. You may add other warm-up exercises. 7. UPRIGHTS: START Slow upward motion. Don't shrug your shoulder. If you shrug your shoulder your Trapezius muscle is helping you "cheat" on the exercise to finish upward motion. Push down slightly with your left hand on the shoulder pad and drop your shoulder down as you begin the upward motion with your right arm. If your shoulder must shrug to finish your upward movement, you are probably using too much weight. 8. UPRIGHTS: FINISH Keeping your shoulder down, don't shrug. Slowly bring unit up above horizontal, then slowly lower. It is important that you do reps SLOWLY when going up and down. Never jerk the weight up. (You have too much weight if you have to jerk device up) Keep your body upright, don't bend or sway side-to-side while doing the exercise. You don't need heavy weights for proper delt isolation exercises. 9. YOU MAY DO THE SEATED UPRIGHT RAISES. Your elbow pointing directly out to your (9a) side, (9b) forward or (9c) slightly towards the back. This stimulates your deltoid heads differently. 11. SIDE DELT ISOLATION: FINISH Upward Movement. Your elbows will be pointing directly out to your side for this exercise. Maintain slow movements up and down. Make sure to keep your chest against the bench. If you are bending over properly, you should feel the isolating "burn" on your side delt. Repeat the entire program (1-6 above) 2 more times. Create a program that gives your delts the most intense workout. Incorporating DELT FORCE® into your exercise routine will provide the perfect finishing touch to your delts! WARRANTY: For 2 years from the date of purchase, any materials or workmanship which may be defective will be repaired or replaced. This warranty does not apply to damage as a result of mishandling or abuse, improper assembly, or modification. ORDERING INFO: If you're looking to build wider, bigger, stronger delts, or you've had an injury or problem with your shoulder or rotator cuff, Delt Force can provide great results. Simple device, simple exercise, outstanding results !